815 Eddy Street, San Francisco, California, U.S. The Electronic Frontier Foundation (EFF) is an international non-profit digital rights group based in San Francisco, California. The foundation was formed in July 1990 by John Gilmore, John Perry Barlow and Mitch Kapor to promote Internet civil liberties. EFF provides funds for legal defense in court, presents amicus curiae briefs, defends individuals and new technologies from what it considers abusive legal threats, works to expose government malfeasance, provides guidance to the government and courts, organizes political action and mass mailings, supports some new technologies which it believes preserve personal freedoms and online civil liberties, maintains a database and web sites of related news and information, monitors and challenges potential legislation that it believes would infringe on personal liberties and fair use and solicits a list of what it considers abusive patents with intentions to defeat those that it considers without merit. In April 1990, Barlow had been visited by a U.S. Federal Bureau of Investigation agent in relation to the theft and distribution of the source code for a series of Macintosh ROMs. Barlow described the visit as "complicated by [the agent's] fairly complete unfamiliarity with computer technology. I realized right away that before I could demonstrate my innocence, I would first have to explain to him what guilt might be." Barlow felt that his experience was symptomatic of a "great paroxysm of governmental confusion during which everyone's liberties would become at risk". Barlow posted an account of this experience to The WELL online community and was contacted by Mitch Kapor, who had had a similar experience. The pair agreed that there was a need to defend civil liberties on the Internet. Kapor agreed to fund any legal fees associated with such a defense and the pair contacted New York lawyers Rabinowitz, Boudin, Standard, Krinsky and Lieberman about defending several computer hackers from a Harper's magazine forum on computers and freedom who had been the target of Secret Service raids. This generated a large amount of publicity which led to offers of financial support from John Gilmore and Steve Wozniak. Barlow and Kapor continued to research conflicts between the government and technology and in June 1990, Barlow posted online the influential article entitled "Crime & Puzzlement" in which Barlow announced his and Kapor's plans to create an organization to "raise and disburse funds for education, lobbying, and litigation in the areas relating to digital speech and the extension of the Constitution into Cyberspace." In 1990, Mike Godwin joined the organization as its first staff counsel. Then in 1991, Esther Dyson and Jerry Berman joined the EFF board of directors. By 1992, Cliff Figallo became the director of the original office, and in December 1992, Jerry Berman became the acting executive director of the organization as a whole, based in a new second office. EFF's second big case was Bernstein v. United States led by Cindy Cohn, in which programmer and professor Daniel J. Bernstein sued the government for permission to publish his encryption software, Snuffle, and a paper describing it. More recently, the organization has been involved in defending Edward Felten, Jon Lech Johansen and Dmitry Sklyarov. The organization was originally located at Mitch Kapor's Kapor Enterprises offices. By the fall of 1993, the main EFF offices were consolidated into a single office, headed by Executive Director Jerry Berman. During this time, some of EFF's attention focused on influencing national policy, to the dislike of some of the members of the organization. In 1994, Berman parted ways with EFF and formed the Center for Democracy and Technology, while Drew Taubman briefly took the reins as executive director. In 1995, under the auspices of Executive Director Lori Fena, after some downsizing and in an effort to regroup and refocus on their base of support, the organization moved offices to San Francisco, California. There, it took up temporary residence at John Gilmore's Toad Hall, and soon afterward moved into the Hamm's Building at 1550 Bryant St. After Fena moved onto the EFF board of directors for a while, the organization was led briefly by Tara Lemmey, followed by Barry Steinhardt (who had come from the closely allied Technology and Liberty Program at the American Civil Liberties Union, and eventually returned to the ACLU). Not long before EFF's move into new offices at 454 Shotwell St. in SF's Mission District, Mike Godwin departed, long-time Legal Director Shari Steele was appointed as executive director, and staff attorney Cindy Cohn became the legal director. In the spring of 2006, EFF announced the opening of an office again in Washington, D.C., with two new staff attorneys. 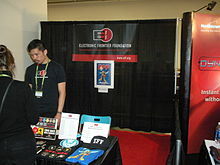 In 2012, EFF began a fundraising campaign for the renovation of a building located at 815 Eddy Street in San Francisco, to serve as its new headquarters. The move was completed in April, 2013. On April 1, 2015, Shari Steele stepped down as Executive Director. Cindy Cohn became the new executive director, Corynne McSherry became the legal director, and Kurt Opsahl became the general counsel. By the mid-1990s the EFF was becoming seriously concerned about the refusal of the US Government to license any secure encryption product for export unless it utilized key recovery and claims that governments could not decrypt information when protected by DES, continuing even after the public breaking of the code in the first of the DES Challenges. They coordinated and supported the construction of the EFF DES cracker (nicknamed Deep Crack), using special purpose hardware and software and costing only $210,000. This brought the record for breaking a message down to 56 hours on 17 July 1998 and to under 24 hours on 19 Jan 1999 (in conjunction with distributed.net). The EFF regularly brings and defends lawsuits at all levels of the US legal system in pursuit of its goals and objectives. The EFF has long taken a stance against strategic lawsuits against public participation (SLAPP) as attempts to stymie free speech and advocated for effective anti-SLAPP legislation. Many of the most significant technology law cases have involved the EFF, including MGM Studios, Inc. v. Grokster, Ltd., Apple v. Does, and others. The EFF Pioneer Awards are awarded annually to recognize individuals who in its opinion are "leaders who are extending freedom and innovation on the electronic frontier." In 2017, the honorees were Chelsea Manning, Mike Masnick and Annie Game. The Patent Busting Project is an Electronic Frontier Foundation (EFF) initiative challenging patents that the organization claims are illegitimate and suppress innovation or limit online expression. The initiative launched on April 19, 2004 and involves two phases: documenting the damage caused by these patents, and submitting challenges to the United States Patent and Trademark Office (USPTO). EFF publishes through several outlets such as the online periodical EFFector (ISSN 1062-9424), as well as its websites, blogs, and on social networking services. 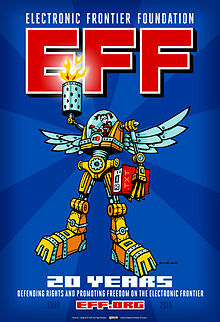 EFF's first book was published in 1993 as The Big Dummy's Guide to the Internet, a beginners' how-to manual by contracted technical writer Adam Gaffin, and made available for free download in many formats. MIT Press published it in paperback form in 1994 as Everybody's Guide to the Internet (ISBN 9780262571050). The online edition was updated regularly throughout the 1990s and early 2000s, and translated into dozens of languages. The organization's second book, Protecting Yourself Online (ISBN 9780062515124), an overview of digital civil liberties, was written in 1998 by technical writer Robert B. Gelman and EFF Communications Director Stanton McCandlish, and published by HarperCollins. A third book, Cracking DES: Secrets of Encryption Research, Wiretap Politics & Chip Design (ISBN 9781565925205), focusing on EFF's DES Cracker project, was published the same year by O'Reilly Media. A digital book, Pwning Tomorrow, an anthology of speculative fiction, was produced in 2015 as part of EFF's 25th anniversary activities, and includes contributions from 22 writers, including Charlie Jane Anders, Paolo Bacigalupi, Lauren Beukes, David Brin, Pat Cadigan, Cory Doctorow, Neil Gaiman, Eileen Gunn, Kameron Hurley, James Patrick Kelly, Ramez Naam, Annalee Newitz, Hannu Rajaniemi, Rudy Rucker, Lewis Shiner, Bruce Sterling, and Charles Yu. The Electronic Frontier Foundation's blog, DeepLinks, is a major section of its main website at EFF.org. The EFF sent a video message of support to global grassroots movement CryptoParty. The EFF was active in the United States presidential election 2016 because of online phishing related to the controversy over fabrication of election results. J. Alex Halderman, a computer security professor at the University of Michigan, wrote an article that was published in Medium in 2016 stating he thought it was advisable to have a recount on some of the election results from states like Wisconsin, Michigan, and Pennsylvania. In retaliation for Halderman standing up for the uncertain election results, a hacker sent anti-Semitic and racist emails to students at University of Michigan signed from Halderman. The EFF publicizes these controversies and promotes the reduction of online phishing. The EFF has developed some software and browser add-ons, including Switzerland, HTTPS Everywhere, and Privacy Badger. The EFF has also conducted a project named Secure Messaging Scorecard which "evaluated apps and tools based on a set of seven specific criteria ranging from whether messages were encrypted in transit to whether or not the code had been recently audited." Version 1.0 is accessible here. As of April 21, 2017[update], a revised version is under development. EFF as of 2014[update] had $23 million in assets, having received multiple grants or donations above 1 million dollars in its history. On February 18, 2004, the EFF announced that it had received a bequest of US$1.2 million from the estate of EFF member Leonard Zubkoff, a software developer and entrepreneur. It used $1 million of this money to establish the EFF Endowment Fund for Digital Civil Liberties. Beginning in 2010, the EFF began regularly receiving income from the Humble Indie Bundle. In 2010, these donations made up 14% of EFF's total revenue. Between 2011 and 2014, the amount received from Humble Bundle reached $7.5 million or 23% of the EFF total revenues. In 2011, the EFF received $1 million from Google as part of a settlement of a class action related to privacy issues involving Google Buzz. The Electronic Privacy Information Center and seven other privacy-focused nonprofits protested that the plaintiffs' lawyers and Google had, in effect, arranged to give the majority of those funds "to organizations that are currently paid by Google to lobby for or to consult for the company." An additional $1 million was obtained from Facebook in a similar settlement. In December 2014, the Adams Charitable Foundation granted EFF a $3 million endowment to fund the new Adams Chair for Internet Rights. In late June 2014 the EFF flew a GEFA-FLUG AS 105 GD/4 blimp owned by, and in conjunction with, Greenpeace over the NSA's Bluffdale-based Utah Data Center in protest against its purported illegal spying. Yasha Levine, writing for magazine The Baffler, described the EFF as astroturf created and funded by Silicon Valley, stating they don't actually defend rights for the users of Internet platforms, instead defending large Internet companies (which are, according to him, EFF's biggest benefactors) by lobbying for said companies' interests and deviating attention from their business practices (especially regarding copyright and privacy) to government practices regarding privacy and censorship, as well as actually lobbying in ways that actively harm Internet users. ^ "A History of Protecting Freedom Where Law and Technology Collide". EFF.org. Electronic Frontier Foundation. Retrieved February 20, 2015. ^ "Board of Directors". EFF.org. Electronic Frontier Foundation. Retrieved February 20, 2015. ^ "Cindy Cohn to Become EFF's New Executive Director in 2015". EFF.org. Electronic Frontier Foundation. November 5, 2014. Retrieved February 20, 2015. ^ a b "Public 990 – Fiscal Year 2016". EFF.org. Electronic Frontier Foundation. 2017. Retrieved December 27, 2017. ^ Barlow, John Perry (June 8, 1990). "Crime & Puzzlement". w2.EFF.org. Electronic Frontier Foundation. Archived from the original on 2014-10-24. Retrieved August 10, 2016. ^ a b Barlow, John (November 8, 1990). "A Not Terribly Brief History of the Electronic Frontier Foundation". w2.EFF.org. Electronic Frontier Foundation. Retrieved December 12, 2015. ^ Kapor, Mitch; Barlow, John Perry (July 10, 1990). "Formation documents and mission statement for the EFF". w2.EFF.org. Electronic Frontier Foundation. Archived from the original on 2015-12-04. Retrieved September 11, 2012. ^ Lebkowsky, Jon (January 11, 1997). "TechnoPolitics". Weblogsky. Archived from the original on November 10, 2006. Retrieved September 11, 2012. ^ "SJ Games vs. the Secret Service". www.sjgames.com. Retrieved 2018-05-27. ^ a b c d e f Harris, Scott (2002). "Freedom Fighters of the Digital World". LA Times. Archived from the original on 2002-01-17. Retrieved 10 October 2018. ^ a b Timberg, Craig (2013). "Try as it might, anti-surveillance group can't avoid Washington". The Washington Post. Archived from the original on 2013-10-12. Retrieved 10 October 2018. ^ McCullagh, Declan (2006-04-27). "EFF reaches out to D.C. with new office". News.CNet.com. CBS Interactive. Retrieved September 11, 2012. ^ "The New EFF HQ". EFF.org. Electronic Frontier Foundation. Retrieved December 2, 2014. ^ "The Eddy Street Era Begins". EFF.org. Electronic Frontier Foundation. Retrieved 2 December 2014. ^ "Shari Steele: A Legacy of Digital Rights". EFF.org. Electronic Frontier Foundation. Retrieved 10 April 2015. ^ "EFF DES Cracker Machine Brings Honesty to Crypto Debate". w2.EFF.org. Electronic Frontier Foundation. July 17, 1998. Archived from the original on 2012-07-22. Retrieved September 11, 2012. ^ "Frequently Asked Questions (FAQ) About the Electronic Frontier Foundation's 'DES Cracker' Machine". w2.EFF.org. Electronic Frontier Foundation. July 16, 1998. Archived from the original on 2012-09-18. Retrieved September 11, 2012. ^ Electronic Frontier Foundation (1998). Cracking DES - Secrets of Encryption Research, Wiretap Politics & Chip Design. O'Reilly Media. ISBN 978-1-56592-520-5. ^ Burr, William E. (2003). "Selecting the advanced encryption standard" (PDF). IEEE Security & Privacy. 99: 43–52. ^ Sophia Cope, House Advances Email Privacy Act, Setting the Stage for Vital Privacy Reform, Electronic Frontier Foundation (April 27, 2016). ^ "EFF Pioneer Awards". EFF.org. Electronic Frontier Foundation. Retrieved September 11, 2012. ^ "Whistleblower Chelsea Manning, Techdirt Founder Mike Masnick, and Free Expression Defender Annie Game Named Electronic Frontier Foundation Pioneer Award Winners". Electronic Frontier Foundation. 16 August 2017. Retrieved 31 August 2017. ^ "EFF Cooperative Computing Awards". EFF.org. Electronic Frontier Foundation. Retrieved September 11, 2012. ^ Bishop, Katina (April 6, 2000). "Big Prime Nets Big Prize: EFF Gives $50,000 to Finder of Largest Known Prime Number". w2.EFF.org. Electronic Frontier Foundation. Retrieved September 11, 2012. ^ Knoll, Landon (October 14, 2009). "Record 12-million-digit Prime Number Nets $100,000 Prize". EFF.org. Electronic Frontier Foundation. Retrieved September 11, 2012. ^ "EFFector". Electronic Frontier Foundation. ISSN 1062-9424. Retrieved October 9, 2013 – via EFF.org. ^ Maass, Dave (December 16, 2015). "EFF Publishes 'Pwning Tomorrow,' a Speculative Fiction Anthology". EFF.org. Electronic Frontier Foundation. Retrieved August 10, 2016. ^ "Message from EFF San Francisco to Cryptoparty Melbourne". Electronic Frontier Foundation. Archived from the original on July 19, 2013. Retrieved July 17, 2013 – via YouTube. ^ Halderman, J. Alex (November 23, 2016). "Want to Know if the Election was Hacked? Look at the Ballots". Medium. ^ Williams, Jamie (February 13, 2017). "Not Okay: Professor Smeared After Advocating for Election Integrity". Electronic Frontier Foundation. ^ a b "Secure Messaging Scorecard". EFF. Retrieved 21 April 2017. ^ "Electronic Frontier Foundation: Overall Score and Rating". Charity Navigator. Retrieved August 10, 2016. ^ a b c "Statement of Activities: July 2013 – June 2014" (PDF). EFF.org. Electronic Frontier Foundation. 2014. Retrieved August 10, 2016. ^ "Internet Pioneer Gives Over $1.2 Million to EFF to Defend Online Freedom". w2.EFF.org. Electronic Frontier Foundation. Retrieved December 8, 2011. ^ Esguerra, Richard (July 28, 2011). "The Humble Indie Bundle: Epic Win for Creators, Customers, and Digital Civil Liberties". EFF.org. Electronic Frontier Foundation. Retrieved May 19, 2013. ^ "Statement of Activities: July 2012 – June 2012" (PDF). EFF.org. Electronic Frontier Foundation. 2013. Retrieved August 10, 2016. ^ "Statement of Activities: July 2011 – June 2012" (PDF). EFF.org. Electronic Frontier Foundation. 2012. Retrieved August 10, 2016. ^ Parloff, Roger (July 30, 2012). "Google and Facebook's new tactic in the tech wars". Fortune. Time, Inc. Retrieved December 3, 2014. ^ "Protesters Launch a 135-Foot Blimp Over the NSA's Utah Data Center - Slashdot". Yro.slashdot.org. Retrieved 2 December 2014. ^ Greenberg, Andy (June 27, 2014). "Protestors Launch a 135-Foot Blimp Over the NSA's Utah Data Center". Wired.com. Condé Nast Publications. Retrieved December 2, 2014. ^ Levine, Yasha (July 2018). "All EFF'd Up". The Baffler. No. 40. New York: The Baffler Foundation. Archived from the original on July 20, 2018. Retrieved July 16, 2018. "Big Dummy's Guide to the Internet by Electronic Frontier Foundation". Project Gutenberg. "How To Bypass Internet Censorship". Archived from the original on 2014-12-19. also known by the titles: "Bypassing Internet Censorship or Circumvention Tools". flossmanuals.net. 2011-03-10. p. 240.